Select several sprigs of fresh mint, and rinse if needed. 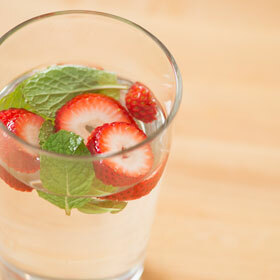 Add to 1 to 2 quarts of fresh, cold water and refrigerate for several hours to let flavors mingle. The longer you let it soak (even up to a day), the more prominent the flavors will become. Amount per serving: 0 calories, 0g total fat (0g saturated fat), 0g carbohydrates, 0g protein, 0g dietary fiber, 0mg sodium.